When a user completes purchase of your WSO, WSOPro will send payment notification to DAP to the IPN URL configured in your WSO Pro Product Settings (details below). DAP will then automatically create the membership account, allow user access to the product and send out the thank-you email configured under the DAP products page => Notification tab with the login details. But your users do NOT have to wait for the welcome email. DAP will also display the membership credentials (login url, username and password) on the final landing page after WSO Purchase is complete to the buyers. 1. Make sure product name in DAP eXactly matches the product name in WSO Pro. 2. 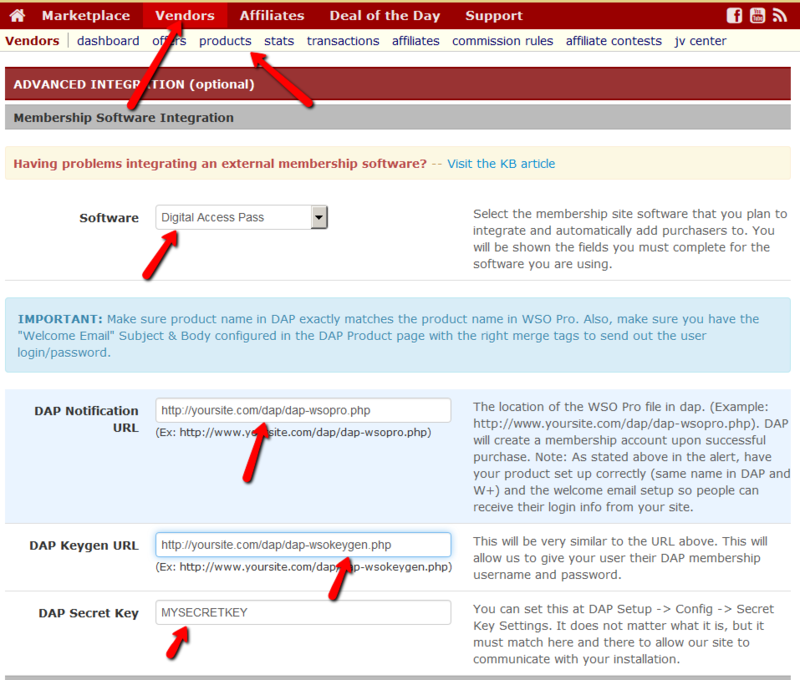 Set the IPN (Notification) and Keygen URL in your Warrior Plus Vendors => Products => ADVANCED INTEGRATION section. Replace yoursite.com with the name of your website. It will allow DAP to create a membership account for the buyers after successful WSO Pro purchase. It will allow WSO Pro to display the DAP Membership Login Credentials (Login URL, Email / Password) to the buyers on the final post-purchase landing page. 3. Configure a “Welcome Email” Subject & Body in the DAP Products page => Notifications tab with the right merge tags to send out login credentials to the buyers. To test, complete a purchase like your users would, and see if the membership account gets created in your DAP Admin => Users => Manage page. See if the login credentials are displayed on the final landing page after purchase. You should also receive a welcome email with the login credentials. I just went to create my first WSO and there is only one field that says “IPN Notification/Key Generation URL” Which do I place in that box? If you don’t the options that are in the screenshots in this document, please talk to Warrior Plus support and find out where the options are. Maybe they need to update your account. One other question: do I need to have the latest version of DAP in order to integrate with Warrior Forum? I’ve placed a few test orders and keep getting a notification that there’s a product mismatch (even though I copied and pasted the product name so it matches identically). Yes, you do need to upgrade to latest version as all the new updates are part of latest version of dap (dap 4.7.2). Hey, I am unable to get the DAP login details to display on W+ thank you page. Any advise or additional resources on this? If yes, then we’ll need the logs to see why it’s not working. Please open a support ticket with the details and we’ll take a look.